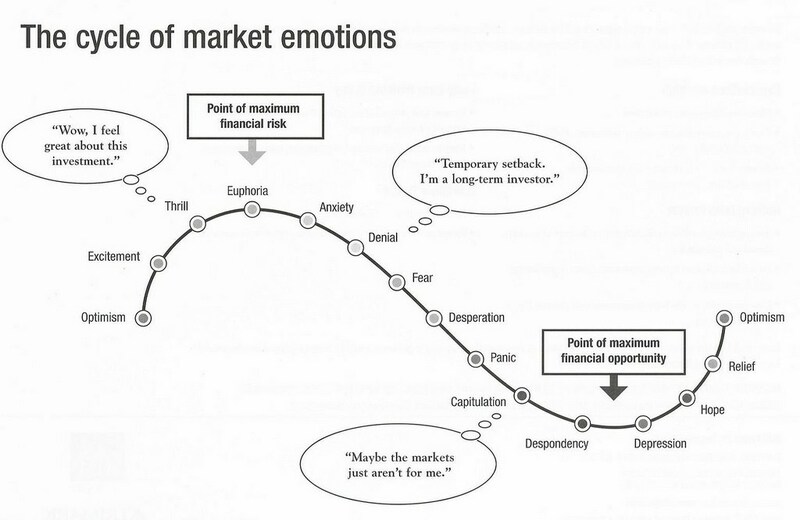 It has been proven repeatedly by various market experts that stock market cycles exist. Whether you believe in them or not that is up to you, but as a technical trader myself I see price action repeat on virtually all time frames from the intraday charts, to daily, weekly, monthly, quarterly, yearly, and beyond. In fact, cycles tend to move in series of 3’s, 7’s and 10’s, and multiples of these as well. So, 3 bars, 7 bars, 10 bars no matter the time frame, though I find the 10min, daily, weekly, and monthly charts work best. 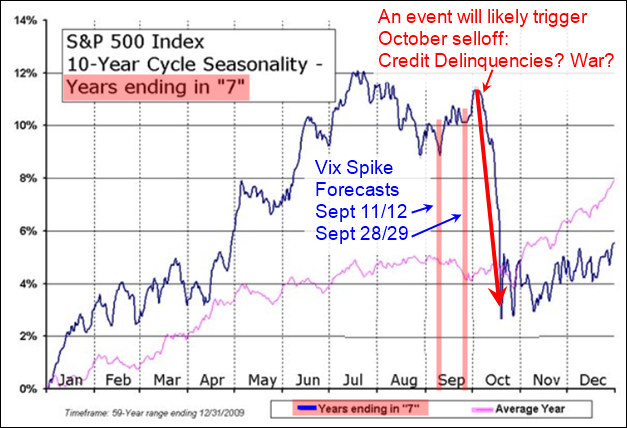 Knowing these cycles lengths, let’s review briefly where the markets are situated in terms of a seasonality, volatility, and the 3, 7 and 10 cycle periods. What I am about to show you is very intriguing. I will let the charts do all the talking as they show the picture clearly. In short, this is just a quick snap shot of some angles in which I look at the stock market. 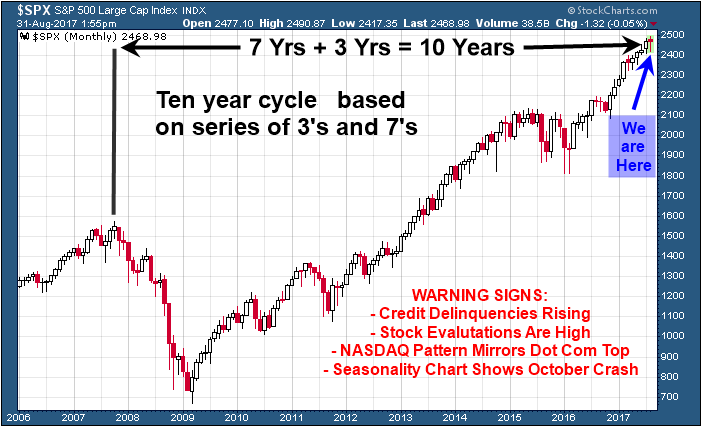 There are a lot different things happening (cycles, technical analysis patterns, and fundamentals) which have been painting a bearish picture for the stock market. In fact, last year the US equities market were only a couple down days way from trigging a full-blown bear market. But Trump was elected and that triggered a massive rally which I see as being a final exhaustion move (euphoria) just before a major market top. 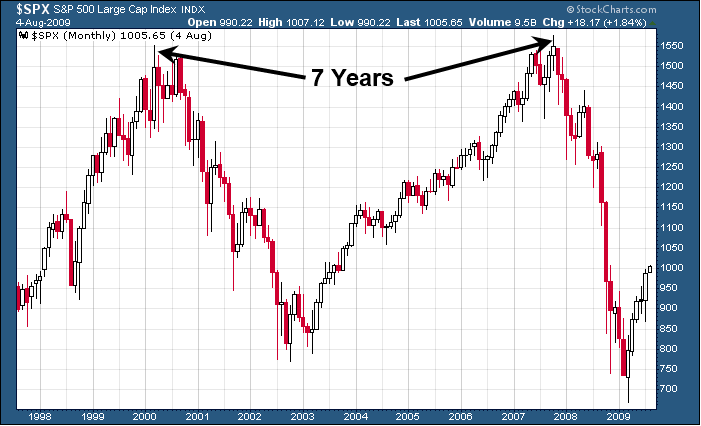 I have been watching and waiting for what I feel will be the next major market top for just over a year now. Why? Because once a market top looks to be in place we must adjust all our long-term portfolio holdings into different asset classes with CASH being a huge portion of it. Stock prices typically fall 7 times faster than they rise so just imagine being properly positioned for a bear market with a portion of your position knowing you could make 7 years of slow painful growth in only 8-12 months when the bear market starts. I recently did a seminar talking about his and how one can use inverse ETF’s and short selling to profit from the next financial down turn which will eventually happen.